HERSHEY, Pa. … Hershey received power-play goals from Graham Mink and Alexandre Giroux and a 28-save shutout by goaltender Michal Neuvirth en route to a 3-0 win over Manitoba in Game 3 of the Calder Cup Finals on Saturday before a sellout crowd of 10,696 fans at Giant Center. Holding a 2-1 series lead, the Bears will host Game 4 on Sunday. Hershey improved to 8-1 at home this postseason and handed Manitoba just its second shutout of the entire season. San Antonio’s Josh Tordjman backstopped his club to a 1-0 victory over the Moose on Dec. 7, 2008. Neuvirth (14-5) picked up his league-leading fourth shutout of the playoffs, the most by an AHL rookie since Rochester’s Mika Noronen racked up an overall-record six during the 2000 postseason. All four of Neuvirth’s playoff shutouts have come at Giant Center, and Saturday also marked the first shutout by a home team in the Calder Cup Finals since Chicago’s Pasi Nurminen blanked Bridgeport in Game 3 of the 2002 championship series. Playing at home for the first time since May 17, the Bears took a 1-0 lead in the opening period as Mink tipped home Staffan Kronwall’s shot from the left circle for his first goal of the series and sixth of the playoffs at 6:22. Hershey extended its advantage to 2-0 at 9:38 of the second frame when Giroux tallied his league-leading 14th goal of the postseason. Stationed in the right circle, the AHL MVP one-timed a feed from Keith Aucoin past Moose goaltender Cory Schneider for the Bears’ second power play goal of the night. Kronwall picked up his second assist of the game on the play, as the defenseman began the scoring sequence by saving a Manitoba clearing attempt at the left point. 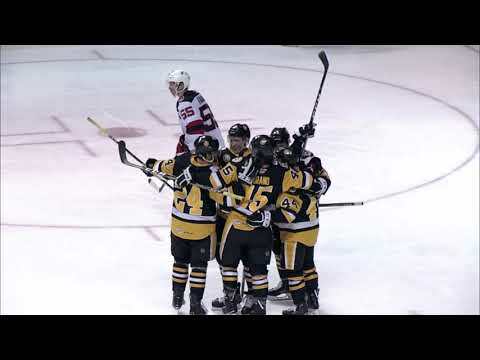 Hershey’s Quintin Laing added an unassisted shorthanded goal into an empty-net in the game’s closing minute for his second tally of the playoffs. The Bears finished 2-for-3 on the power play, registering multiple man-advantage markers for the second time in three Calder Cup Finals games and for the third time in their last four contests overall. Meanwhile, Hershey’s penalty kill denied all five Manitoba power play attempts, including a 50-second 5-on-3 opportunity during the second period. The Moose had gone 15 straight games without suffering a regulation loss since dropping a 2-1 decision at Toronto on Apr. 19 in Game 3 of the division semifinals. Schneider finished with 21 saves in the losing effort.